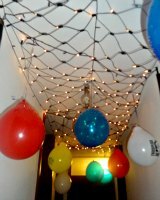 This was timed obstacle course where each Birthday Party 'attendee' went through 4 different obstacles while carrying Yoda on their back. Stopwatch on hand, 1 second penalty for mis-jumping the hoops or not clearing the cushion an landing on it. Best time, won a prize. 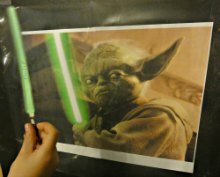 This was a fun get started activity for our Jedi training. 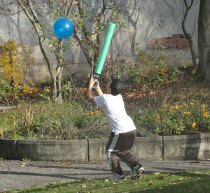 Each Jedi in training had a balloon they had to balance or bounce on their sword. It was fun for the kids, they worked in pairs, one counting the number of bounces and I timed them for 60 seconds. After both partners did it the highest number of bounces won a prize. 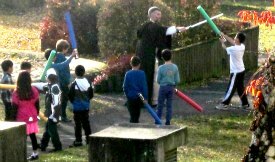 High light for the kids, was real sword training(not with real swords, real training with their swords) with our guest Obi-Wan Kenobi. We ran through some Martial Arts sword training with attack and defence moves, strikes, parry moves and foot movement. The kids loved the free sword playing they had a chance to duel with each other as a conclusion to the sword training. Each Jedi knight will stand in a hula hoop and knock away 10 balls thrown at them. We used small plastic balls from our ball pit. Have 2 goups running at the same time if you can. The Jedi knight that struck away the most out of the 10 balls thrown wins a prize. We drew on the pavement in our backyard two large death stars with sidewalk chalk. Jedi knights were split into 2 star wars birthday teams and they each received 6 water balloons. 6 team members threw one water balloon each with the goal of destroying the chalk imprint of the death star. 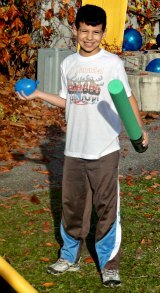 I alternated throws between both groups with all kids encouraging each other. It worked out great and all members on both teams received gummies and chocolates. All Jedi knights received a Jedi robe and a lollipop when we came back inside. I will post pictures and a step-by-step video on how I made these quick and easy robes without any sticking or sewing. You can check out a closeup of these Jedi robes in our Star Wars Birthday Decorations written page. Princess Leia and Queen Amidala have been trapped by the dark force. Jedi knights must locate all the star wars holding cells(balloons) and free whomever they are holding(pop the balloons) to save both the Princess and the Queen to restore balance to the force. With prizes for the ones who found the princess and Queen. We took a large sheet of shimmering red fabric(3 meters length by 1,5 meters wide) and lay it along our hallway. All of the star wars birthday party participants lined up and would place a wooden block(we have a bag of wooden building blocks) and walk back to the back of the line. Each child picked up a block walked on the placed blocks to add another block, and back again to the back of the line. (touching the walls or stepping into the lava was a penalty and the furthest block was removed) The kids got hungry from all the training outside and became very motivated to get across the lava. They all had a lot of fun. This was a great one. Cake, cupcakes, chips, fruit, drinks, sandwiches, pizza, and sushi. While they ate and opened presents(photo with each child and their present to the Birthday child) Darth Vader prepared himself for his entrance. 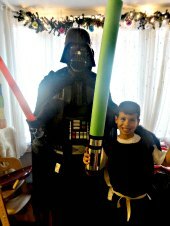 For this star wars birthday party we had to have Darth Vader come in. He came in full costume with light up sword and sound module to use the dark force against all the newly trained Jedi. The Jedi knights grouped together and fought against Darth Vader. The good side proved to be too much agaisnt the dark side and Darth Vader was once agin defeated. We continued with some fun sword play and having a good time with all of the kids at the party until their pick up. 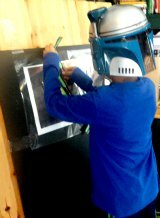 Birthday theme parties are a lot of fun and work, but all the kids really had a great time, this was a really fun packed star wars birthday. We wanted all the kids to have something to remember their star wars birthday party so we had each of them keep their Jedi swords and Jedi robes in addition to receiving their Thank you grab bags from the Birthday boy. 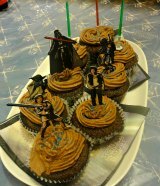 We only had 3 hours scheduled to run all these party for kids ideas for our star wars birthday theme--it got a bit tight with the timings. I think 4 to 4,5 hours would have worked better. Next time we will expand the party time to 4 hours--maybe from 1-5pm. 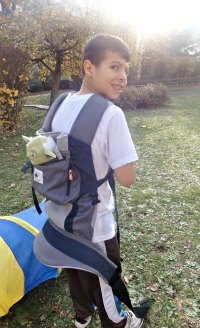 Here at family-life-parenting we love to receive your comments, what has worked for you and anything you would love to hear from us about. We have a big family and love celebrating birthdays. Check back with us as we will add more Birthday theme party ideas we have done for instance Pooh Bear, Elmo and friends, the Amazing Race, Buzz Lightyear and our newest addition we are presently planning will be two teams in the search for the Pink Panther diamond. Have great Birthday Party celebration.